Masaya Volcano National Park in Nicaragua is a fascinating place of other-worldly scenery. The Masaya Caldera is made up of 5 different craters, San Pedro, Santiago, Nindiri, San Juan and Masaya. 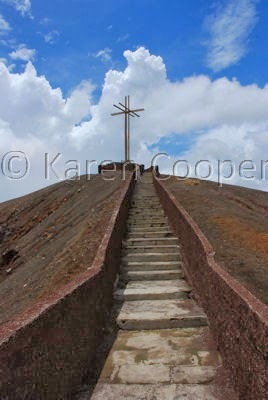 This cross is on Santiago Crater and was built there by the Spaniards in the 16th Century. It is named "La Cruz de Bobodilla" after Father Fancisco Bobadilla, and was placed on the lip of the crater in order to exorcise the devil. Okay, I'm pretty sure it's not the exact same cross, since I saw metal bolts holding it together. But you get the idea ...... they thought this was the mouth of hell. And an appeasement to any god would have been a good thing. Except for the eruptions that followed throughout history. Not everything works according to plan. Everything here is big. Even the sky is big. Massive white fluffy clouds blend in with the sulpher dioxide cloud spewed out of the volcano. They blend in together to make some of the most spectacular scenery I have yet experienced here in Central America. Except ... when it forms acid rain. Interesting post. Glad you're having time to travel! I love the way this was composed! Isn't it awesome how photographers see the world in a totally different way? The sky is awesome, did you use a polarizer, or is it just that blue? Hi Angie .. thanks for your comment. The sky is really that blue, no polarizer used. The world is such an amazing place!